You need relaxation, tranquility, beach in direct Fußentfernung? 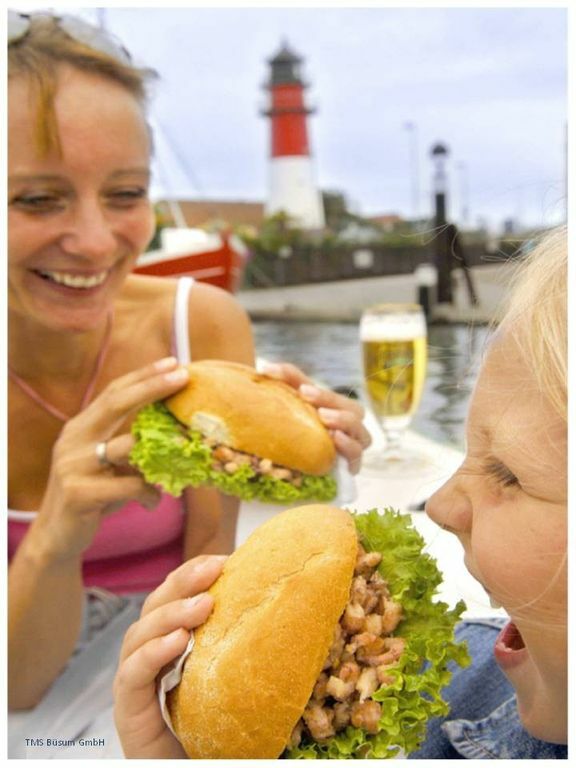 Or are you looking for water sports challenges, want to stroll, want to stroll through the Büsum pedestrian zones or the largest fishing port on the west coast and snack a fish sandwich? You want to learn kiting or surfing in a surfing / kite school right behind the dyke in a protected area? Are you looking for a lovingly and fully furnished holiday home? Then you are right in the 'Ferienwohnung zur Perlebucht'! The apartment is in the 1st. First floor of a house of owner-occupied apartments of a very quiet road without through traffic and was completely renovated in 2011 with a new kitchen and new bathroom and was designed modern-maritime. The bedroom is furnished with a new double bed and a new wardrobe, which offers plenty of storage space for suitcases and clothing. The modern living room (with a comfortable (sleeping) sofa, TV, hi-fi system, board games, books and a dining area for up to 4 people takes you to the spacious balcony, which offers plenty of sun from morning to evening. So that the sunrays (which are high enough not to radiate directly into the living room) also remain on the balcony, white roller blinds have been installed on doors and windows, which you can pull if necessary. Direct connection to the living room has the newly designed kitchen with PVC floor and side window that is equipped with all common appliances and utensils. From salt to pepper, from kitchen roll to towel, from refrigerator to stove, from pans to hand mixers and, of course, from plates to forks everything that the heart of a cook or a cook desires. The tiled bathroom is equipped with a toilet, washbasin, circular shower, hairdryer, soap and many storage facilities. In the rest of the apartment laminate is laid. You can also, for example, B. Supplies or luggage in the storage room, which is of course also available to you. Here you will also find a second refrigerator, For example, for cooling further drinks in stock. You can park your car and / or your bike free of charge directly in front of the main entrance. Then you will only be separated by a staircase from a relaxed and wonderful, well-deserved holiday. Enjoy your time in this beautiful apartment, we look forward to seeing you! Welcome to Büsum in the 'Ferienwohnung zur Perlebucht'! The bathroom has also been completely renovated and houses a shower with shower enclosure, a toilet, a sink with counter space for toiletries, a closet with plenty of storage space and towel racks. Büsum is a quaint, maritime fishing village full of diversity. You can experience pure relaxation during long walks on the dike, a sunny day on the sandy beach or take a long bike ride right on the water edge. If you like it more active, there are numerous water sports facilities in the immediate 'walking distance to' Holiday Apartment Pearl Bay 'available. Swimming in the sea or in the water park 'sea pirates', windsurfing, cycling or inline skating - the imagination are no limits. Right in around 2 km from the center load a lot of nice little shops, doctors, numerous restaurants and cozy cafes to stroll and linger - the perfect distance for a trip by bike. Other restaurants, bistros, shopping, laundry and an ATM machine are located just 500 meters away - nice for an evening stroll in the setting sun. We warmly welcome you and look forward to welcoming you! Die genannten Preise beziehen sich auf 2 Erwachsene mit dem angegebenen Mindestaufenthalt, jede weitere Person (max. 4 Personen), je Nacht 5,00 €. Kürzere Aufenthaltsdauern sind je nach Buchungslage möglich, auf Anfrage unterbreite ich Ihnen gern ein Angebot.. Haustiere auf Anfrage, 5,00 € pro Nacht pro Tier Endreinigung fakultativ 49,- € pro Aufenthalt Wäschepaket (Bettwäsche und Handtücher) je nach Absprache 10,00 € p.P.